As an artist, I am first and foremost a storyteller. I love seeing new worlds and new stories unfold as I work. 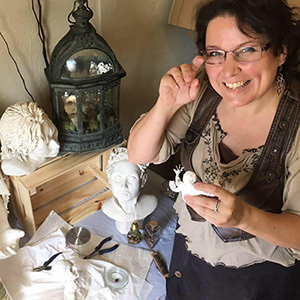 I sculpt to make tangible new realities and new ways of seeing, new worlds, creatures and dreams. For centuries artists have questioned our assumptions about the everyday, from the human to the divine. I want to build work that questions views of reality, and the way we affect the earth, the objects, and the entities around us. I enjoy creating transformed and transforming environments, parallel realities of personal culture and peculiar passions. I want to present ideas, images, and issues in different terms, to create a sense of wonder and possibility. Every world we make is really a dream for, or a nightmare of, our own. The Worlds we make possible or visible in our work are in turn made possible or visible in the greater world around us. By telling stories we create the world and the reality we want to live in. My art can also be found online on my deviantArt gallery, while my writing is at The Five Wits Press, World of Shandor, and Goodreads.